A port of Irem Corp's arcade brawler, Spartan X (Kung-Fu Heroes). Gang boss Mr. X has kidnapped Sylvia and taken her to the Devil Castle. The skilled martial artist Thomas enters Mr. X's dojo and prepares to fight his way to the top of the castle to rescue her. Fight your way through hoards of oncoming enemies with punches and kicks and take out the boss character on each floor to progress. Reach the fifth floor to face Mr. X himself and rescue Sylvia from his clutches. Jump then punch or kick to do a Flying Punch or Flying Kick. Crouch then punch or kick to do a Low Punch or Sweep Kick. Game A is designed for beginners and game B for experts. There are five levels to the castle, each swarming with enemies that approach from the left and right. Fight your way to the end of the level within the time limit and defeat the Boss. Every time Thomas is attacked, his energy bar is reduced. Thomas is defeated if his energy bar is emptied or the timer runs out. If your score reaches 50,000pts, you get another player. A Kung Fu expert and the hero of the game. He has to fight his way to the top of the Devil Castle to rescue his beloved Sylvia. He has powerful punches, kicks and jump kicks at his disposal to take out the gang members. Thomas's love who has been captured by the "X" gang. She is being held captive on the fifth floor of the Devil Castle, awaiting rescue. The most common gang members in the castle. The Gripper attacks in groups and will grab Thomas and do a little damage until shaken off. Appears on every level of the castle. Kick = 100pts, Punch = 200pts, Jump Kick = 300pts. A common enemy that appears on every level of the castle. The Knife Thrower throws knives high and low at Thomas. He will move away if Thomas approaches, so wait for him to attack before making your move. Kick = 500pts, Punch = 800pts, Jump Kick = 1000pts. On level 2 of the castle, Dragon Balls will drop from the ceiling. When they hit the ground a Dragon will appear. It breathes a stream of fire from its mouth but it won't move. You can either jump kick the Dragon Ball before it hits the ground, or attack the Dragon directly. On level 2 of the castle, Snake Baskets will drop from the ceiling. When they hit the ground a Snake will appear and move quickly towards Thomas. You can either jump kick the Snake Basket before it hits the ground, or do a sweeping kick to take out the Snake. On level 2 of the castle, the Confetti Ball comes down from the ceiling, suspended in mid-air, before eventually exploding into shards. Thomas can attack it before it explodes. Appearing from level 3 in the castle, Tom Tom is a small martial arts fighter who will somersault through the air to attack Thomas. He is too short to be punched, so do a low punch or sweeping kick while he's on the ground, or attack while he's performing a somersault. Appearing on level 4 of the castle, swarms of Poisonous Moths fly out of holes in the walls and get in Thomas's way. If you time your movements well you can attack them, but it's best to try and run past them. The gang boss who appears at the end of level 1 of the castle. He waves his stick around to try and hit Thomas. Avoid his swings and run in to attack. The gang boss who appears at the end of level 2 of the castle. He throws boomerangs in much the same way as the Knife Thrower, only the boomerangs will return to him. He can throw two at a time, so duck or jump and time your attacks. The gang boss who appears at the end of level 3 of the castle. He is extremely large and powerful, and can take out up to half of Thomas's life in a single blow. He will raise his fist or his leg to signal which kind of attack he will perform, so avoid that attack and move in for the kill. The gang boss who appears at the end of level 4 of the castle. He is an adept magic user and casts a variety of spells to try and stop Thomas. He will shoot magic fireballs that transform into Poisonous Moths or Dragons and he can teleport himself. If you attack his head it will fall off his shoulders, but he will take no damage and appear with a new head. Hit him low to defeat him. The notorious gang leader and martial arts expert who appears at the end of level 5 of the castle. He is an extremely defensive yet powerful fighter, so it can be difficult to land any attacks, and he can replenish his health over time. He is extremely vulnerable to jump kicks, and if you manage to land one it will take out half of his health bar in one go! Kung Fu is one of very few third party ports developed by Nintendo. It was based on the arcade game Spartan X (Kung-Fu Master in the U.S.) by Irem, which in turn is based on the 1984 movie Kuai Can Che (Spartan X in Japan, Wheels on Meals in the U.S.) starring Sammo Hung, Jackie Chan and Yuen Biao. Both the game and the movie feature the same names for the lead character (Thomas) and the damsel (Sylvia). 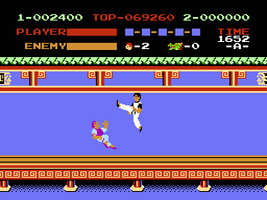 Jackie Chan's image was used in the marketing material for the arcade version. While there were ports of the game on a number of systems, and a sequel released on the Famicom, only this first Famicom port was developed by Nintendo.